Bring a small pan with water to a boil, and cook the green beans and corn for 2 minutes. Drain and rinse in cold water. Transfer to a bowl, and add the cucumbers, cherry tomatoes, avocado, sliced onion, garlic, and cilantro. Sprinkle with salt, and mix well. Mix the ají limo paste with the lime juice, and pour over the vegetables. Stir everything well. Place a lettuce leaf on each plate, and serve some salad over each leaf. If you have a sensitive palate and are not crazy about spicy food, start with very little ají limo paste (1/4 teaspoon), try it, and see if you want to add more. If you want a more authentic ceviche feel, you can use Peruvian giant kernel corn instead of sweet yellow corn. Serve a large chunk of boiled corn on the side of the dish instead of mixing it into the salad. You can find this corn in Latin American grocery stores, usually frozen. Another way of making the presentation more ceviche-like, is by boiling a sweet potato and serving some slices next to the salad. If you can't find ají limo, use any hot chili pepper you like. When I think of summer, I think of refreshing, crunchy, aromatic, and overwhelmingly colorful salads. Thankfully, my body craves these water-filled foods as the temperature starts to rise, so my compulsive food-buying is always put to good use in the enormous salad bowls I like to eat. As easy as making a summer salad is, however, people tend to get in the habit of using the same ingredients or ways of making them over and over again, until their signature salad gets old and boring, and they don't want to eat another bite of it for the rest of their lives. In fact, many people don't know that preparing this simple dish can be as creative a process as cooking any other thing. 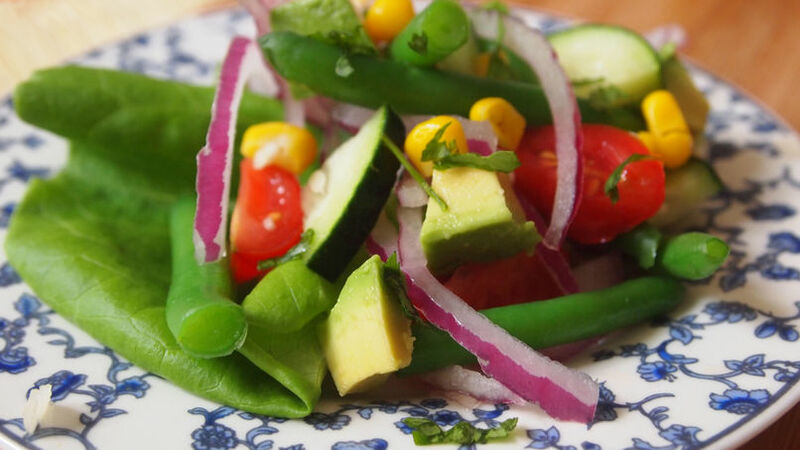 Here I will show you how to make a salad that will take you out of your routine. In this recipe I've turned my salad into a ceviche using all the seasonal ingredients I could find.